The much anticipated reboot of 1984's hit comedy 'Ghostbusters' has finally released its first full-length trailer. It shows the team of paranormal researcher Abby Yates (Melissa McCarthy), particle physicist Erin Gilbert (Kristen Wiig), nuclear engineer Jillian Holtzmann (Kate McKinnon) and historian Patty Tolan (Leslie Jones) assembling to take on a sudden rise in ghost activity. It looks fresh and new while paying homage to the original film. Oh, and there's plenty of slime, loads and loads of it. The opening scene in the trailer finds Abby and Erin approaching an apparition, like in the original, in the New York Public Library before spewing a torrent of slime. And yes Slimer is back but the trailer didn't spoil expected cameos from original cast members - Dan Aykroyd, Bill Murray, and Sigourney Weaver. The premise of the movie is something is amplifying psychic activity in New York resulting into an onslaught of ghosts all over town and the ladies assemble to take down the threat. This time around the apparitions can also possess humans which leads to a funny bit with Patty and Abby.Staying true to the first film we'll see an Ecto-1, a Lower Manhattan headquarters, and proton packs. Some lucky fans got to see the trailer a day early on the Sony lot with director/writer Paul Feig and co-writer Katie Dippold. Feig emphasized the film was a reboot and not a sequel. There's no passing of the torch but instead an organic story of discovery and invention that feels totally original for the new cast. The trailer introduces the team quite well, establishing them as smart capable paranormal hunters but not leaning too much on humor just yet with the first trailer. The scope and effects of the film look great and as epic as we'd expect from a summer blockbuster. The movie arrives in theaters on July 15 so there'll be plenty more trailers to come that show more of the film's humor and monsters. So far it looks like fans and skeptics alike should feel at ease with Feig's vision (just don't read the comment sections!). 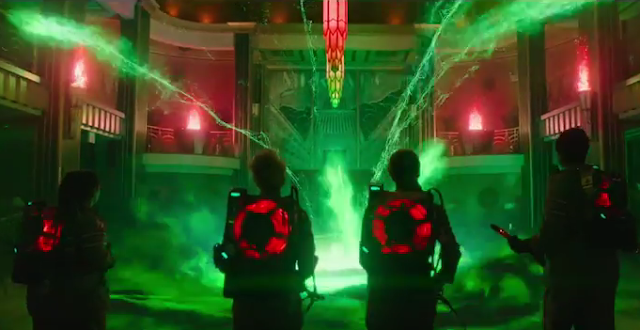 Just kidding, leave your thoughts, good and bad, below about what you think of the first 'Ghostbusters' trailer.